View of Goodrich castle in Herefordshire. 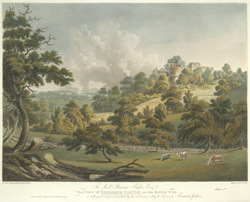 The castle is situated on a rock overlooking a crossing point of the River Wye. The oldest part of the castle is the 12th century keep, which was built by Godric Mappestone- it is thought that the castle was named after him. The castle was restructured in the 13th century to create a large castle complex including a gatehouse, inner bailey, a great hall and a chapel. After the Civil War the castle was not modernised and since this time has fallen to ruin.